Since DuckDose’s closure several months ago, a new site called DuckDose.net has come online. Though they are using the same branding, this new site is NOT associated with the original in any way, shape, or form. Anything you read in the DuckDose review below does not apply to DuckDose.net. Proceed at your own peril. When the original site was shutting down (please see below), the owners recommended ModafinilXL as an alternative to their customers. There has been no further communication from them since, including any indication that they’ve started up a new site. As of April 2018, DuckDose has, unfortunately, decided to close its doors. All orders placed while their website was still up will be honored. Until the last one is delivered, the company will also continue to provide email support to all their existing customers. As a reason for the closure, the owners of DuckDose have stated their decision to pursue other opportunities (of what sort is not clear). Just like Modafinil Cat did with DuckDose when they shut down, DuckDose is recommending ModafinilXL as an alternative for their customers. DuckDose will be missed. They were arguably the best online seller of modafinil and left some big shoes to fill. Hopefully, ModafinilXL is up to the task. Ever since Modafinil Cat closed their store, people have been searching for trustworthy alternatives. They were the most-trusted seller of modafinil and armodafinil the internet has known. Thousands of their former customers now needed an alternative. But, even while closing their business, the owners of Modafinil Cat didn’t leave their loyal fans out to dry. 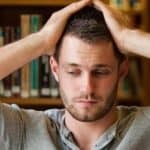 Instead, they went out of their way to test various online modafinil suppliers so that they could recommend a reliable source for everyone to use instead. They only ended up recommending two companies: DuckDose and Afinil Express. The big question was could either live up to and fill the giant gap left by Modafinil Cat’s closure? The short answer is yes. Both companies are worthy successors. And in this post, we’ll review and take a much closer look at one of those Modafinil Cat alternatives, DuckDose. An in-depth review of AfinilExpress is also available for anyone interested in pursuing them as a supplier. As is the case with many online sellers of modafinil, very little is known about DuckDose. No one knows where they operate from or who runs the company. This may seem a little scary at first. But, given the often controversial nature of their business, it’s not entirely surprising nor anything to worry about. What is know is that DuckDose operates a website on which anyone can order modafinil and have it shipped worldwide. It uses a very similar distribution method to what Modafinil Cat used. If it works, why re-invent the wheel. DuckDose specializes in the sale of generic versions of modafinil and armodafinil. 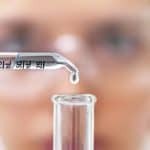 All products they offer are manufactured by two large Indian pharmaceutical companies: HAB Pharmaceuticals and Sun Pharmaceuticals. The company’s shipping methods obfuscate what’s in the package well. In the vast majority of cases, your order arrives at your door within a few days with zero complications. So that you know what to expect, the step-by-step ordering and shipping process will be outlined later on in this review. There are quite a few benefits of choosing DuckDose as your modafinil supplier. Let’s take a closer look at some of these selling points. As already mentioned, DuckDose sells generic versions of both modafinil and armodafinil. The two smart drugs are similar, but there are noticeable differences between the effects of the two. Personal preference plays a significant role in which you should buy. All things being equal, modafinil is the recommended product for new users because of its slightly milder effects. 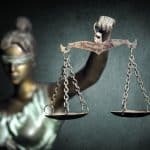 For a detailed analysis and explanation of the differences between Modalert, Waklert, Modvigil, and Artvigil, please see here. By keeping the selection of products to just four, DuckDose is able to offer some of the best prices around. The per-pill cost decreases as the quantity you purchase increases. That’s standard fare. 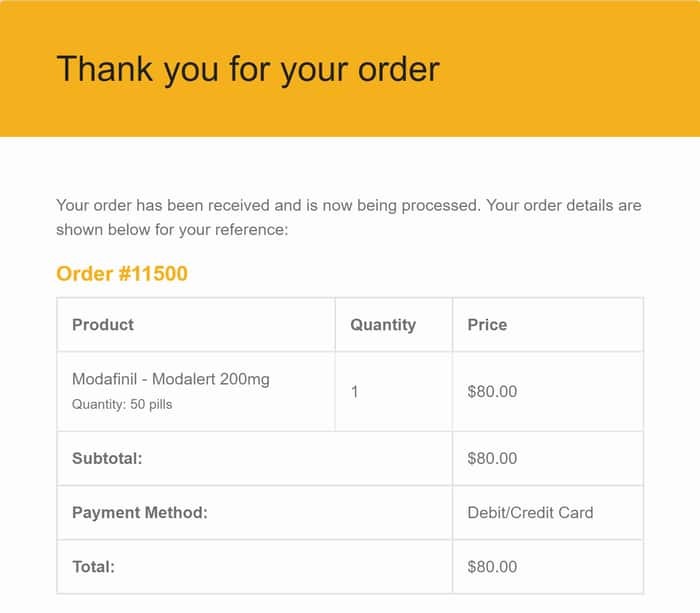 For Modalert and Modvigil, the generic versions of modafinil, the prices range from $1.50 per pill for an order of 50, all the way down to $0.85 per pill if you get 300. On the armodafinil side of things, Waklert and Artvigil cost anywhere from $1.80 per pill when you get 50, to as little as $1.00 per pill for 300. Those are very competitive prices, on part or better than what Modafinil Cat used to offer for the same products. If you’re a seasoned modafinil user, you will have undoubtedly noticed the constant friction online sellers have with credit card processors. It’s a massive problem for sellers of modafinil, but like many, DuckDose has turned this problem into an opportunity for their customers. Instead of paying by credit card, you can order with Bitcoin. You’re making Duck Dose’s life easier since they don’t need to worry about problems with payment processing. In return, they give you a massive 20% discount on your order. If you have any questions about using Bitcoin as a payment method, directly reach out to DuckDose’s customer support. They’ll be happy to answer your questions and make your life as easy as possible. If you return to DuckDose for your future modafinil purchasing needs, they will also tack on an additional 10% off for your loyalty. Both discounts stack, which means you can save upwards of 30% of the regular price. At this time, DuckDose does not offer any coupon codes. The best way of getting a discount off their already low prices is to use Bitcoin as a form of payment or by being a returning customer. That said, coupons are something DuckDose continuously releases from time to time. The best way to get notified of any is to get on the seller’s mailing list. In general, you can expect to see at least a one coupon code sent out every quarter. DuckDose offers free shipping on all orders. No minimums to keep track of. No sticker shock at final checkout. What you see is what you get. If you add a product to your cart that costs $80, you’ll pay no more than $80. 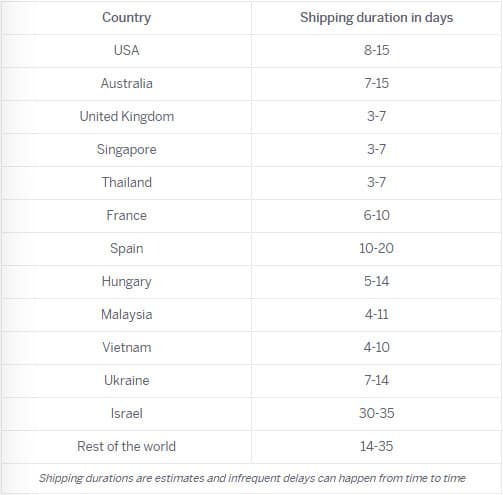 Shipping times obviously depend on where you live. 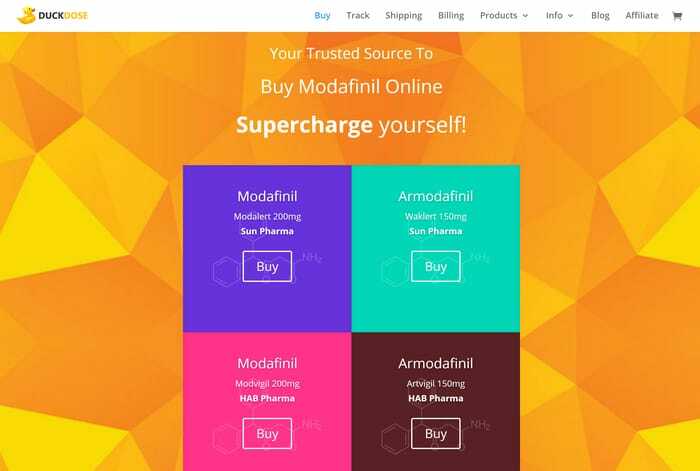 All modafinil sellers need to ship their products from overseas (usually India), so the wait can be on the long side. That said, compared to many other vendors, DuckDose’s shipping times are still on the shorter end of the range. Shipping to the US, for example, takes as little as 8 days. For a shipment of modafinil from halfway across the world, that’s pretty quick. Elsewhere in the world, you can expect delivery anywhere from 7 to 21 days after placing your order. 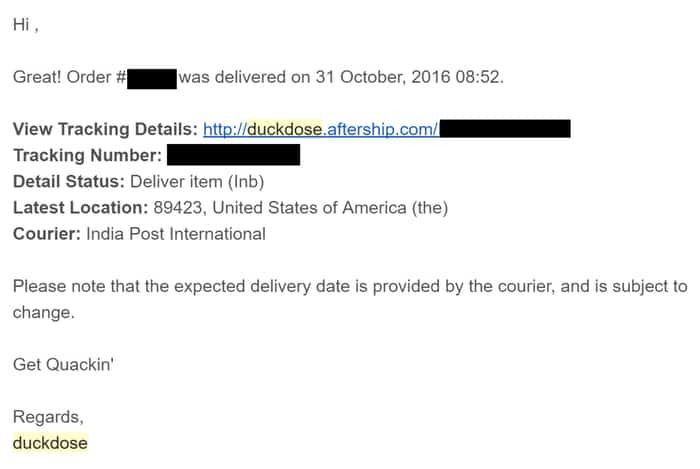 DuckDose claims to ship all orders within 24 hours. So far, they’ve always held up their promise. However, if you order over the weekend or during a holiday, you might experience a slight delay. Please note that you don’t receive your tracking number until 1-2 days after the product is shipped. This is due to the slight delay on the India post side of things and is nothing to worry about. To put you more at ease, here is what the Duck Dose order process looks like. Step 1: Visit DuckDose.com and choose the products you want. Step 2: Select the desired quantity. Step 3: Enter personal details, choose payment method and place order. 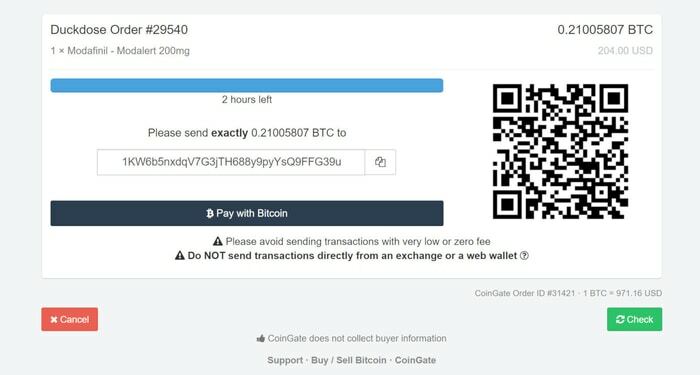 Step 4: Pay invoice with Bitcoin (or enter your credit card details on the prior page). 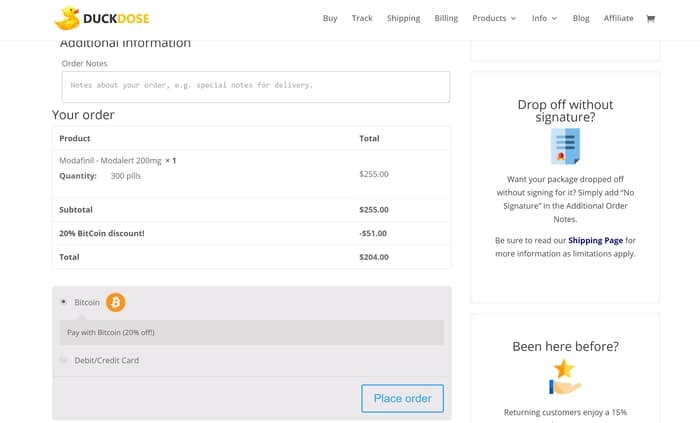 Once you send payment as directed, you’ll instantly receive an email confirming your order. 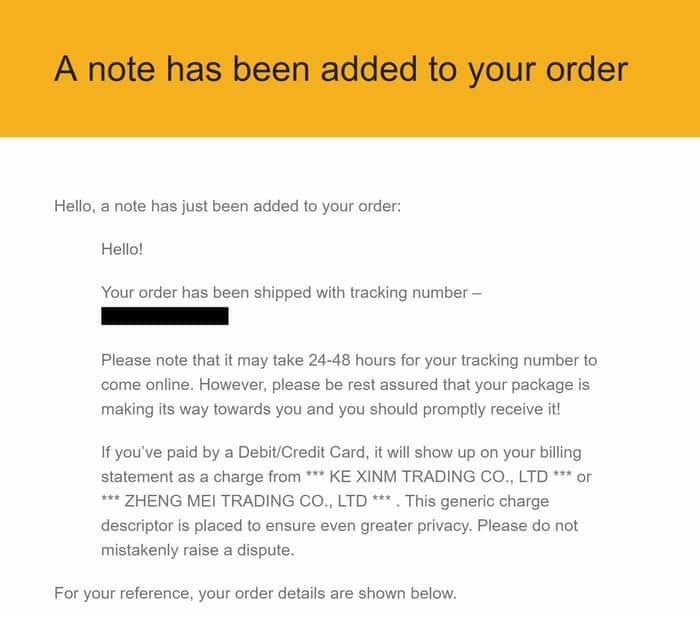 The shipping confirmation for the order should arrive within 1 day, indicating your package is on its way. While the package is en route, you’ll receive several emails updating you on the latest status of your order. A delivery message confirmation will also be sent to you. The whole process is straightforward and transparent. If, at any point, you have questions, just reach out to the DuckDose support team. They’re always incredibly helpful. Any modafinil order you make from DuckDose is guaranteed to be delivered. If for some reason your original package doesn’t make it, the company has a free reshipping policy. Alternatively, you can choose to have your purchase refunded in its entirety. 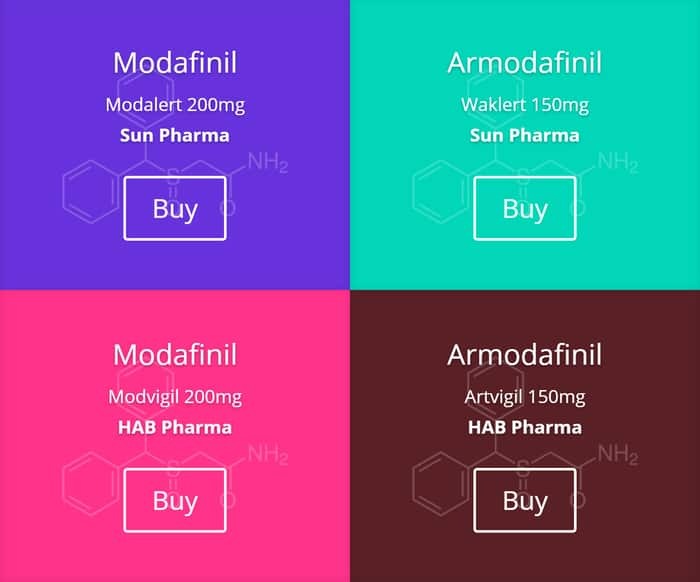 Though technically buying modafinil online is illegal, in practice it’s just frowned upon. 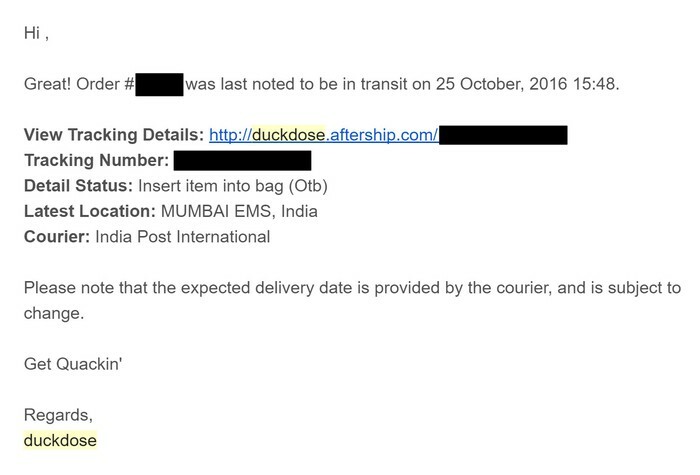 In the rare situations where your order is seized by customs, DuckDose’s offers you peace of mind. In the absolute worse case, you’ll have to wait a few extra days while they re-ship your package. 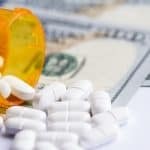 Due to the sometimes controversial nature of getting modafinil off the internet, privacy when doing so should be a top priority for both buyer and seller. With DuckDose, once again, there is nothing to worry. Every order is shipped in discreet wrapping which doesn’t reveal anything about what’s inside. Unless the package is opened, none will be the wiser. So, on a small scale, your privacy is unconditionally guaranteed. But what about the larger question of online privacy? 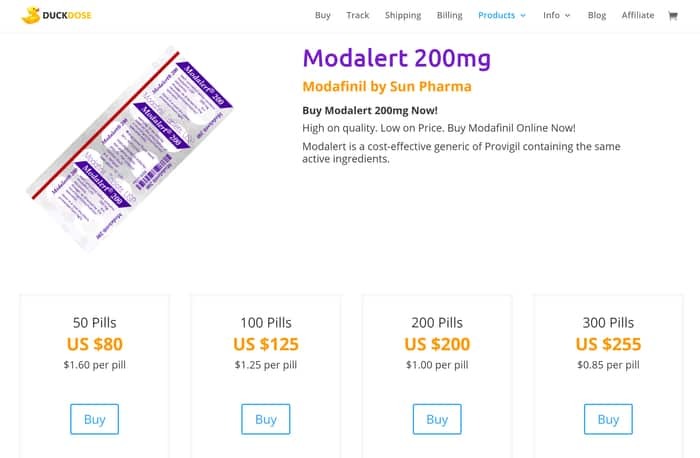 Can the government, your employer, or hackers find out that you ordered modafinil? While there’s always a small chance of something like that happening, DuckDose is 100% committed to keeping all your private information secure. They do everything in their power to make to prevent anyone from finding out who their customers are. Ultimately, it’s DuckDose’s reputation that is at stake. It is in their best interest to ensure your privacy to the best of their capabilities. On additional thing you can do to further prevent anyone from finding out about your order is to use Bitcoin. It’s a completely anonymous form of payment that leaves no paper trail. 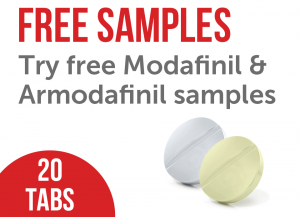 So, not only will you get the 20% discount mentioned above, but you’ll also help ensure everyone will be kept in the dark about your modafinil purchases. The subject of DuckDose’s customer support was already mentioned a few times throughout this review, but it’s worth reiterating again. This is a company which has the best support in the industry, period. Yes, though competitive, they’re not the cheapest option for your modafinil needs. But nobody else can beat them when it comes to taking care of you, their customer. Dealing with DuckDose’s support is almost refreshing. Not just other modafinil vendors, but huge companies like Google and Facebook should take a page from their book. Of course ideally, you never want to have to contact support. But realistically, problems will arise sooner or later. When they do, you’ll be glad you decided to order modafinil from DuckDose. Simply put, DuckDose is one of the best modafinil vendors online, and a worthy alternative to the now-defunct Modafinil Cat. The price is competitive, the products high-quality and the service outstanding. Once you experience firsthand what was described in this DuckDose review, you’ll be unlikely ever to want to try a different modafinil seller. Everything about the company, from its website to its helpful staff, makes you want to do business with them.